The IRS will give you an automatic extension to file your federal tax return. 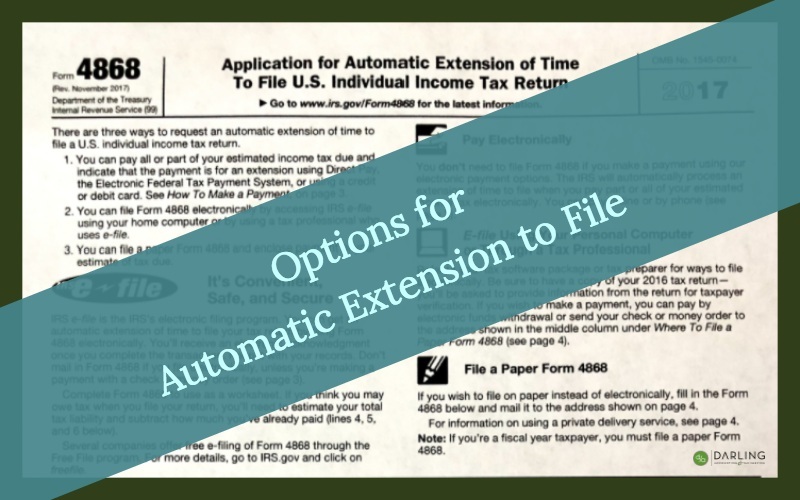 This extension form must be filed by April 17th 2018 this year. The extension will avoid any penalties for filing late. If you owe any taxes you should try to make any payments you can at this time to avoid any interest on the unpaid taxes. The extension does not waive interest penalties on outstanding taxes just late filing penalties. Late Payment Penalty. The late payment penalty is usually ½ of 1% of any tax (other than estimated tax) not paid by April 17, 2018. It is charged for each month or part of a month the tax is unpaid. The maximum penalty is 25%. The late payment penalty won’t be charged if you can show reasonable cause for not paying on time. Attach a statement to your return fully explaining the reason. Don’t attach the statement to Form 4868. You’re considered to have reasonable cause for the period covered by this automatic extension if both of the following requirements have been met. 1. At least 90% of the total tax on your 2017 return is paid on or before the regular due date of your return through withholding, estimated tax payments, or payments made with Form 4868. 2. The remaining balance is paid with your return. File an automatic extension even if you cannot pay at the time. Don’t rush to file if you don’t have everything together. Its better to get a little more time to file an accurate return than rush to file and have to file an amendment the tax return later.